Via metafilter, a wonderful website: Pets in America. "Tiger Summers, Weighs 18 pounds 3 oz." 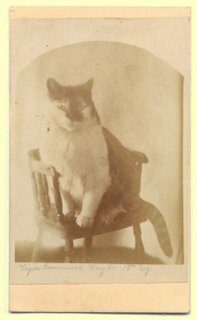 I love the way the cat is posed in a chair, apparently to provide the sense of heft (look how he fills out that chair!). But must be a child's chair. More delights await you. Check it out. Do you know the work of Teresa Mangum? She is a Victorianist but also deeply involved in studies of animal/human relations both now and in Victorian yesteryear. Most recently I saw her give a paper on poems that Victorians wrote mourning the death of their pets. I'm trying to keep my human animal from throwing a barrage of balls at my feline animal, otherwise I'd post links. I don't, but sounds like something I should know. Maybe I can get some links from you another time. Or I suppose I could probably do a little search of my own, huh?